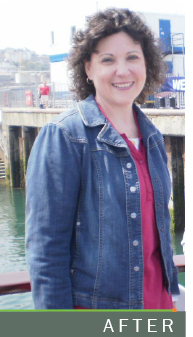 My name is Michele Hanson and I have had the Lap-Band since February 2009. 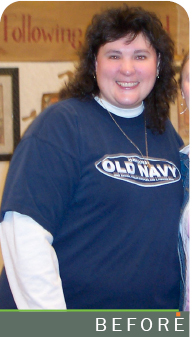 I reached my goal weight in August 2010 and have lost 145 pounds. It truly is difficult to put on paper just what the last 18 months have been like but it's been the best experience and I wish I had done it years ago. I'm a tall person; just under six feet. Growing up, that meant I was the "big kid" even though I wasn't really very overweight. But "big" turned into "fat" because kids can be quite cruel. Looking back at old photographs, I now see a normal-sized, tall girl/young lady surrounded by short, very thin friends. I was always trying to lose weight and be thinner. So my mental perception of myself has always been as overweight - it was a defining characteristic. I can't pinpoint a specific time in my life when I began to gain weight significantly - it crept on pound by pound, year after year. Mine is not an unusual story - it's been told countless times before. For the past 15 years I battled with my health, trying every diet in the book, losing and gaining the same weight, and then some, over and over again. With this yo-yo dieting came the debilitating consequences of obesity: high blood pressure, pre-diabetes, and significant joint and back pain. I was constantly tired, out of breath and unable to walk long distances, let alone exercise to any real extent. I was turning 40 in a few years and knew that if I didn't do something now, the second half of my life would be far worse than the first half. I first heard of the Lap-Band system from television commercials and from there I researched it through the Internet. I found that a Lap-Band Center of Excellence was less than an hour away from where I lived. Out here in rural Wyoming, that's not far at all! My first contact with Mona Urwin, the Patient Advocate for the program at Regional West Medical Center, began a friendship that I cherish to this day. She couldn't have been more helpful, encouraging or friendly. Knowing that she was speaking from her own personal experience meant a lot to me. I attended her bi-monthly support groups where I met wonderful people in all stages of the Lap-Band weight loss process. Through much prayer, counsel, and research, I determined that this was the program for me. I enrolled, was accepted, and completed the pre-surgery steps quickly. I handled the surgery and recovery very well, smoothly moving through the initial stages of alternate eating. The pre-surgery education was very helpful and of course, I could call Mona at any time. It took a few months to find my sweet spot but once there, I remained quite stable, not having to adjust the band after that for many months. I lost a very steady 10 pounds a month for the first year. The remaining 25 pounds took about six months to lose, and I'm now in the "learning to maintain but not gain, maintain but not lose" stage of the program. Dr. Holloway and the entire staff have been so encouraging and helpful. Their desire to help their patients succeed is so very important to the process! I can't say enough how great an experience this has been in my life. While it certainly has not been easy, the positives have absolutely exceeded the negatives! I will always struggle with the "head hunger" aspect of food addiction but the Lap-Band is such a good tool to help with that by curbing my physical hunger and providing that "instant negative feedback" if I eat too fast or too much. It is indeed a tool that I must use wisely. I can't just be passive about my health and my eating habits. I still pass my reflection and wonder who that healthy person is looking back at me. My blood pressure is normal and I no longer take any medication for it, I am not pre-diabetic, and my joints and back no longer hurt at all. I have discovered the enjoyment of walking and running, bike riding, and hiking. Sitting comfortably in an airplane and in a movie theater still thrills me! Before my weight loss, I couldn't keep up with my family during a trip to Florida. But this summer, a trip to England was not only "doable," it was fantastic! A whole new world has opened up to me, and I can't wait to see where God will lead me next, now that my body is able to do what it was created to do! I am convinced that the second half of my life will now be far and away more healthy and productive now that I have had the Lap-Band procedure.